From Dundee we travelled to Fife, passing the famous golfing destination of St. Andrew's, and listened to a talk and had a workshop with designer, Di Gilpin. 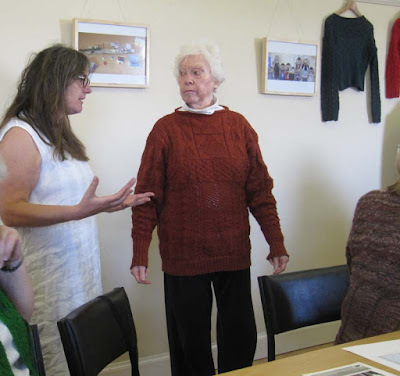 Some local knitters joined us and it was delightful to visit with them and see some of the amazing things that they were knitting. 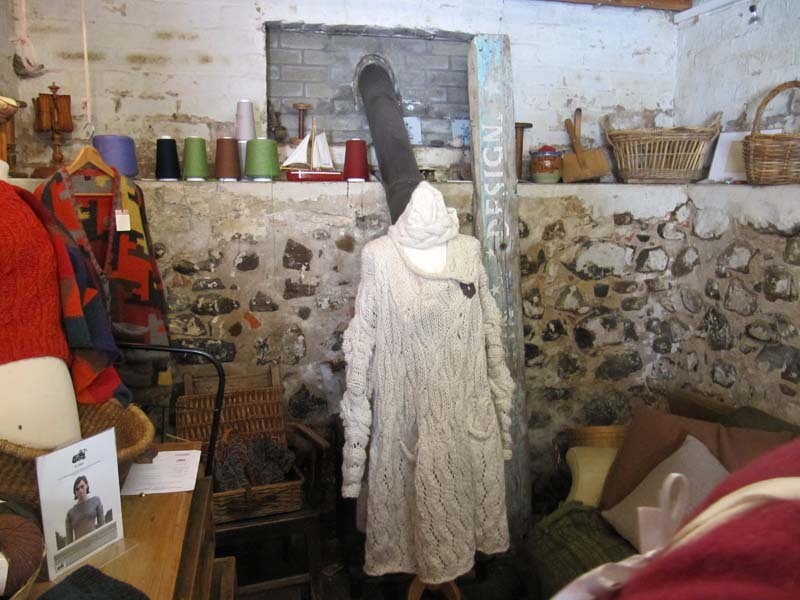 Di talked about her design inspirations, the process, yarn and the business of designing, as well as answering all of our questions. As someone who loves intarsia, I was drawn to this piece that one of the ladies was knitting. It was even more impressive in person than it is in these photos. The inside was neatly finished and looked as good as the outside. This is always a goal of mine. 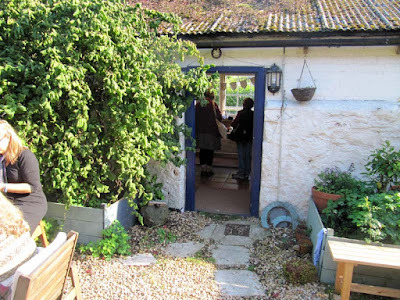 Later we went to Di's studio, a restored stone bothy. (in Scotland) a small hut or cottage. 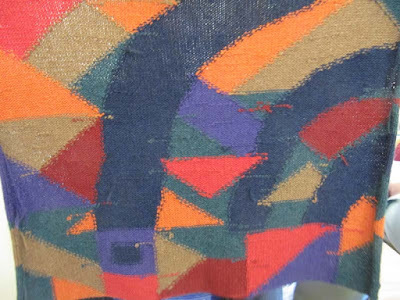 It was very cozy and I'm sure that many of us could picture ourselves sitting and knitting on any given day among all of the sample garments and yarn. We did knit out in her courtyard for a while. 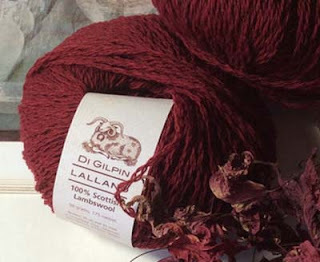 Di has her own line of yarn. 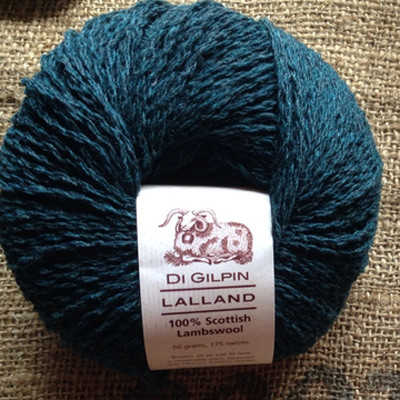 Her cashmere was lovely but I was taken more with "Lalland", 100% Scottish Lambswool. It's close to a sportweight. I bought a sweaters-worth of two colors: ruby red and storm petrel. I haven't yet decided what I'll make. I spotted a ball of yarn that was something I'd never seen, or expected to see. It wasn't for sale. 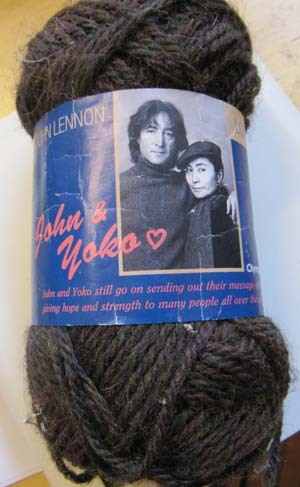 John and Yoko yarn? Who knew? 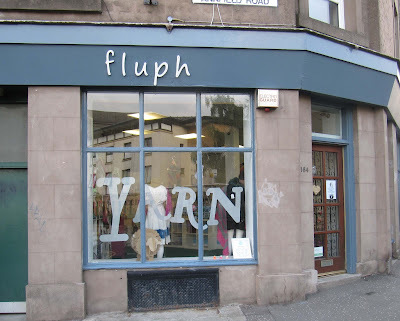 As if that wasn't enough yarn-y goodness for one day, we decided that we needed to visit a yarn shop when we returned to Dundee for the night. 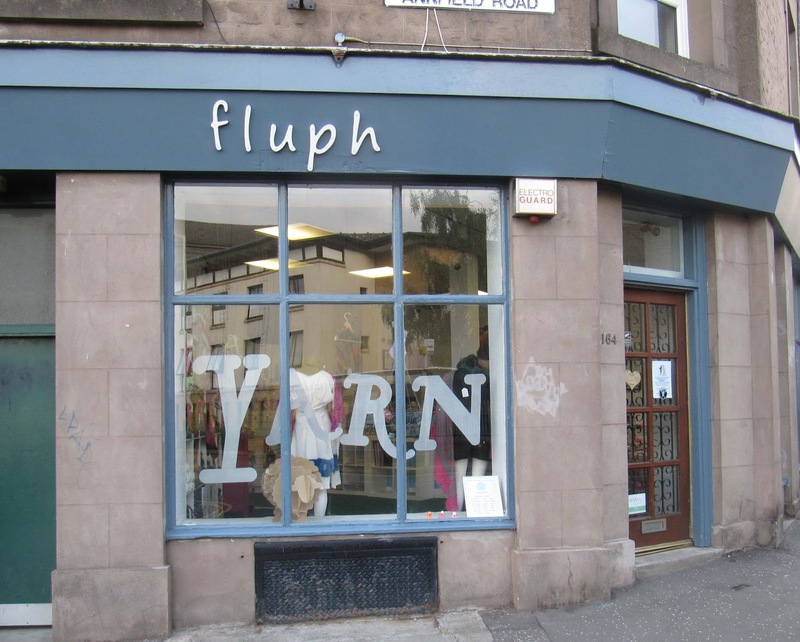 The shop "fluph" was small but so welcoming and stayed open past closing time to accommodate our group of enthusiastic knitters. 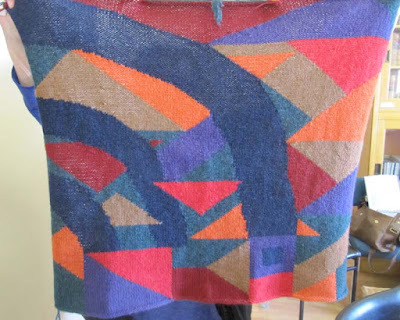 I found a skein of yarn from a local dyer for my Travel Afghan (more on that in a later post). Next stop.... a fabulous day with a kilt maker, and then on to Shetland. Looks like different names for Av's colours (ruby red and storm petrel).